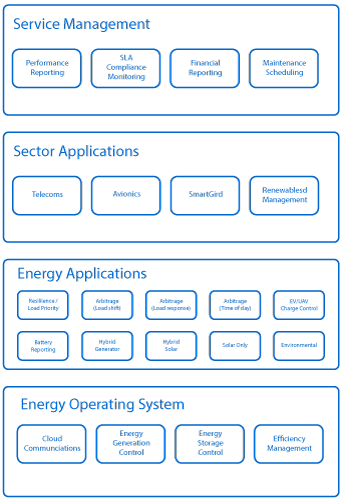 The Silver Power Systems Energy Platform is a comprehensive software suite which enables the internet of energy. The Platform provides control, monitoring and management of all energy generation, energy storage and energy efficiency assets. Using the power of the Internet of Things and Big Data analytics, our 4 layer software architecture allows the platform to be easily customised to meet the specific needs of licensees. The energy OS provides control, monitoring & management of all energy generation, energy storage and energy efficiency assets at a node with cloud connectivity to the network operating centre. Silver Power Systems provide a suite of applications which optimise and control the energy assets to meet specific economic and performance criteria. For example – the smart grid arbitrage application, evaluates real time grid pricing and automatically switches between grid and stored energy, depending upon pre set price thresholds and hysteresis; optimise the energy costs associated with a site, without compromising energy reserve for back-up in the event of grid failure. Silver Power Systems provide a front end and graphical user interface specific to the following sectors: Electric Aircraft & UAVs, Electric Vehicles and Enterprise IoT. The platform provides reporting, management analysis, and billing along with capabilities to provide a clear audit trail for Service Level Agreement compliance. Integral to the platform is a software Battery Management System (soft BMS). This provides the flexibility & control to enable Li-ion batteries to be used in complex system solution. With its advanced reporting and precision control, our software platform provides the foundation for managed service offerings, ranging from Energy as a Service to Grid Arbitrage. The platform can be customised to meet the specific needs of licensees, in sectors as diverse as avionics and telecommunications. Silver Power Systems fully support licensees through the customisation process. If you are interested in becoming a licensee of our Energy Management Platform, please get in touch. Our deep expertise and intellectual property, is centred around the intelligent control of Lithium Ion batteries, management of distributed power systems in challenging environments. | Legal | © Copyright Silver Power Systems Ltd 2019. All Rights Reserved.